Lung King Heen (View of the Dragon) is a top rated Michelin restaurant in Hong Kong, with 3 stars continually to date, making this like the French Laundry of Hong Kong. Controversy erupted after the decision, with some in Hong Kong questioning the ratings. Over the years, they have continued to make believers, as other restaurants have come and gone from the 3 star list. Lung King Heen is located on the fourth floor of the posh Four Seasons Hotel on Hong Kong Island, and is connected to the ultra high end International Finance Center – IFC shopping mall complex. Needless to say, we have eaten here on every trip we have had since they got 3 stars. Our last visit for lunch was at the Spring of 2018. If you have a short stopover in Hong Kong, you can take the MTR express train from the airport and get to the IFC complex in 24 minutes. Our Guide to an authentic Chinese Dinner. The restaurant serves contemporary Cantonese Chinese cuisine using the freshest local ingredients and some modern twists of classic dishes. We came for lunch, which adds a short dim sum list to their standard menu. We ordered off both menus, while concentrating on items marked as a specialty. Mostly locals and a couple tourists were dining. Several bigger parties and regulars. Mostly people in their 40’s and 50’s including ‘Tai Tais’ or rich old ladies reading the newspaper. The dress was far more casual than other three-star restaurants. Extensive menu with a wide variety of dishes spelled out in Chinese as well as English. Dim Sum menu supplemental to main menu. One visit in the Summer 2010 saw a supplemental truffle menu. The menu changes every 3 to 4 months, so some items we reviewed may not be on the menu. Lung King Heen prices are on the high side, but similar to other restaurants of this caliber. Amuse Bouche Marinated Pork Knuckle in a sweet and sour sauce with a spicy kick. Combination appetizer platter (HK$230) brought together roasted goose, barbecue pork with honey, and crispy suckling pig, a combination that we love. In 2018 we had the Poached Chicken with Mashed Ginger and Spring Onions and found that even more incredible. Super flavors in one bite. The char siu was warm, super tender, and came with a sweet sauce. The Goose was boney, flavorful, dark, and riched flavored. The pig as Awesome with its crispy skin and unique thinness. This has to be one of the best versions around. Peking Duck (HK $600) needs to be ordered in advance, so let the reservationist know ahead of time. Ridiculously expensive, this course comes in 2 acts, carved tableside traditional skin and meat on wheat crepes and also as minced duck meat in lettuce cups. The duck was carefully cut up and pre-made peking duck servings were presented to us. Excellent crispy skin coupled with tender meat with excess fat removed. The lettuce cup version was even better, with crispy lettuce, nuts, and sauce in every bite. This dish is enough for 4-6 people. A hot sauce was served with the duck, that proved to be ridiculously good. Wok fried Australian Wagyu beef cubes with spring onions, garlic, and black bepper (HK $420) came to us medium rare, with lots of onion flavor and juicy, settled beef flavors. The signature dish’s high quality meat melted in our mouths. Lung King Heen Roast Chicken (210 for Half) was excellent with a slight salty slant. Again the high quality chicken in Hong Kong eclipses anything we have in the US. Egg Vegetable Tofu Sheet (180) was a healthy, silky, excellent vegetarian dish. A must get for tofu fans. Simmered Noodles with Shredded Chicken in Pottage (HK$240 per person) was simple and clean. Slick Thin egg noodles in a robust broth done well. Fried Glutinous Rice with air dried meats (HK$330) was large enough for 4 people. Lots of preserved sausage, scallops and more, leading to nice subtle tones to the sticky rice. Poached Baby Cabbage with Qi Zi herbs in Soup (HK $140) was most surprising dish of the evening. This beautiful baby cabbage vegetable platter was simply awesome. Artfully arranged, impressive cooking style, a robust supreme broth utilizing Chinese wolfberry, pork bones, chicken, and ham. Yes, this isn’t exactly vegetarian, but stellar nonetheless. This dish changed to a Poached Cabbage with goji berries and mushrooms in sauce in 2018 (HK$240). Not as good as the previous version. Subtle flavors, but very 3 different and nice mushrooms. Complimentary dessert – Chinese wolfberry jello and soft egg tart, both very good but not amazing. In 2018 they had a brown pudding to celebrate Chinese New Year and a pink jujubee pudding. Crispy scallops with pear (HK$ 180) were not cooked how we thought they would be. These signature dish crispy fried scallops had some neutral flavored pear that added up to a bland dish. This dish needs a robust accompaniment to the subtle flavors of a scallop. 3 sauces are brought to the table: XO, lot jew hot sauce, and a ponzu sauce. Cripsy Taro dumplings with assorted seafood and black truffle (HK $60) was excellent, is highly recommended, and was the best dish we had in 2010. This dish came with truffles on top and inside adding to its nice crispy texture. Steamed Rice Rolls with Lobster (HK$7.8 to US$1 – HK$205) – kicked up a basic dish with lots of tender fresh lobster. This dish also had pea shoots, adding to this complex flavored noodle. Subtle soy sauce flavor was poured tableside. One year they included black beans, in 2018 they switched to water chestnuts. Prices have doubled on this dish over the last 7 years! Pan fried XO Rice Rolls (HK$190) were full of bean sprouts and zesty wide noodles fresh from the Wok. Frankly this dish is even better than the Lobster rice rolls. Abalone chicken rice rolls (HK $88) had a sweet soy sauce base in were fairly chewy. Not much abalone and mostly chicken flavor, but still a solid dish. Buttery crust. Truffle braised E-Fu Noodles (HK $180) were on the special lunch menu and proved to be beautiful, and full of rich truffle flavors. Truffle Crispy Spring Roll (HK $66) were very good featuring a crisp golden brown crust and rich truffle flavor. Steamed Lobster and Scallop Dumplings (HK$68) came with 2 very good individually steamed dumplings filled with high-quality lobster and scallops, and a shrimp on top. Very luxurious and pretty. 2010 visit reconfirmed its quality. Steamed Shrimp dumplings with lettuce (HK$99 for 4) was more of a traditional har gow. Very hot out of the steamer. Small shrimp, but a huge intense flavor to it. Steamed beef dumplings with vegetables (HK $64) were see-through, chewy, hot dumplings in which we tasted each distinct ingredient, not a mishmash of each. Steamed scallop dumplings with black truffles and vegetables (HK $60) emerged from the kitchen very hot, with a hint of truffle flavor, and lots of pea shoots. Baked whole Abalone puff with diced chicken (HK$82 per piece) is a signature dish. High quality abalone on a buttery, flaky crust. Crispy Turnip Puffs with Lotus Root (HK$45) was the best we have had and it looked great. Perfect texture, crisphy outside, very smooth, a bite of lotus flavor. Crispy pork dumplings with shrimp, sesame and assorted vegetables (HK$99 for 3) was unusual. Essentially a sweet sesame ball but with savory filling. Crisp, airy, freshly fried, and nicely done. Sort of like a Ham sui Gok. Steamed Fried Rice with diced abalone wrapped in Lotus leaf (HK$80) was a single huge lotus wrapped delicious rice dish with conpoy, tried scalloped, chicken and even had high quality abalone in it. It came from the kitchen very hot and featured flavors that were infused into the rice. They probably cooked fried rice and a walk and then wrapped and steamed it in the lotus leaf. 2010 visit reconfirmed its quality. Barbecued pork with honey (HK $90) was on the sweet side with its honey sauce, but tender and perfect. Soya chicken (HK $80) have bits of spiciness and saltiness infused into small bony pieces of chicken. Chicken’s in Hong Kong are not the huge, antibiotic infused versions as in the United States. Braised Shark’s Fin with Fresh Crab Meat (HK$320) had extremely clear broth and a ton of crab meat. Lots of very good intense flavor. Crispy Pigeon (HK$80) was a reasonably priced but small squab with good flavor. Cooked very well, was probably frozen as they strictly adhered to bird flu guidelines of no live poultry. Double Boiled Superior Bird’s Nest served with Almond Cream, Coconut milk, and crystal sugar (HK$640) was a decadent, almost US$80 dessert that I had to try. It was awesome. The birds nest had a very smooth texture and I was able to blend in my desired level of high quality add ins, Coconut, Rock Sugar, and Almond Cream. Sweetened Almond Cream with Egg White (HK$78) is more subtle a dessert. Rich and sweet with a thick texture. Chilled Mango and Sago Cream with Pomelo (HK$88) is a standout dessert with strong mango flavors on top and some nice thick pudding down under. Crispy sesame balls (HK $48) with sweet potato and pickled ginger was an innovative version of the classic. It possessed a thin skin and some unique flavors. Portuguese Egg Tars (HK$52) were fresh out of the oven, tiny but soft and excellent. The next best thing to visiting Macau. Dessert Sampler (HK$80) consisted of 5 items from their dessert menu, Chilled Coffee pudding layers, Baked Walnut puff, Chilled Mango and Sago Cream with Pomelo, Chilled Osmanthus rolls flavored with green tea, and Sweetened almond crea with egg white. All items were very good. We also got the complimentary desserts with awesome but delicate lotus seed paste filled pastries and multilayered coconut pudding. 2010 included a delicate and not super sweet Osmanthus jello. Steamed Shanghainese Pork Dumplings with crab meat (HK$48) came with 4 elegantly decorated dumplings. Having come from Shanghai a couple days prior, we tasted better ones for a lot less. Wok-Seared Turnip Pudding with Conpoy and Black Mushrooms (HK$48) was a decidedly average dish. A clinker, nothing special to it. Chilled sugarcane pudding with Dragon fruit seeds (HK$48) was an okay dish with weird chewy seeds and not much sugarcane flavor. Lung King Heen had very good service, with our tea cups never empty. On our visit in 2018, service had clearly faded, so we lowered their rating. There were fewer servers and we actually had to hail them. The servers were extremely knowledgeable, courteous, and could recite how each dish was prepared. It is clear that the Michelin inspectors value highly, a stylish restaurant and tip top service. There was no need to spend thousands of dollars or be a regular to get outstanding service. Lunch at Lung King Heen is much more affordable than virtually any other three-star Michelin restaurant. 10% service charge, HK$38 per person for standard Chinese tea. While you are here, be sure to visit City Super in the IFC Mall. A beautiful high end international grocery store with items like A5 Wagyu, Iberico ham, and more. While other restaurants may make a particular dish better, few could put together the combination of excellent food, service, and atmosphere. We would have no hesitation coming back on our next trip to Hong Kong. This is definitely a place to be experienced. There may not exist a Chinese restaurant of this caliber in the USA, with the closest high end Chinese restaurants in North America located in Vancouver, BC, IE Kirin. 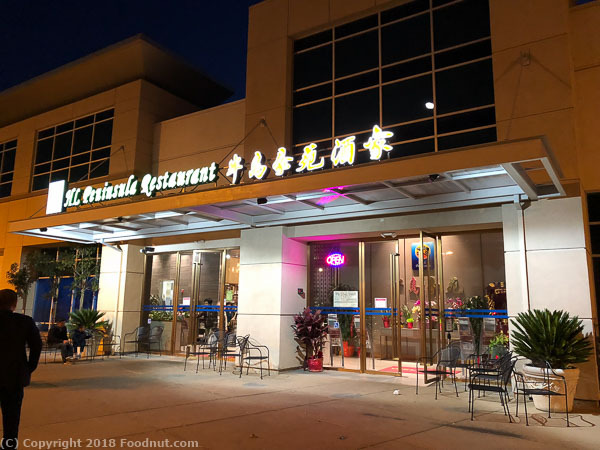 Koi Palace is about as good as it comes in our home area, San Francisco, and their food and service are significantly below Lung King Heen’s. Very very unimpressed with Lung King Heen. Had the executive set menu lunch today. At $430 per head, the food, the service and the decor are all very average. The dim sum is not any different to any other ‘good’ restaurant. The scallops fried rice was dry. The goose was fatty. The soup was tasteless. The service was poor (did not refill teas, and tea pots were not on the table). There is no effort on presentation and no effort on explaining what each dish is. An absolute disappointment. There is nothing special about the place. How did it ever get 3 stars? Had lunch today 8th August 2014 – very very disappointing.